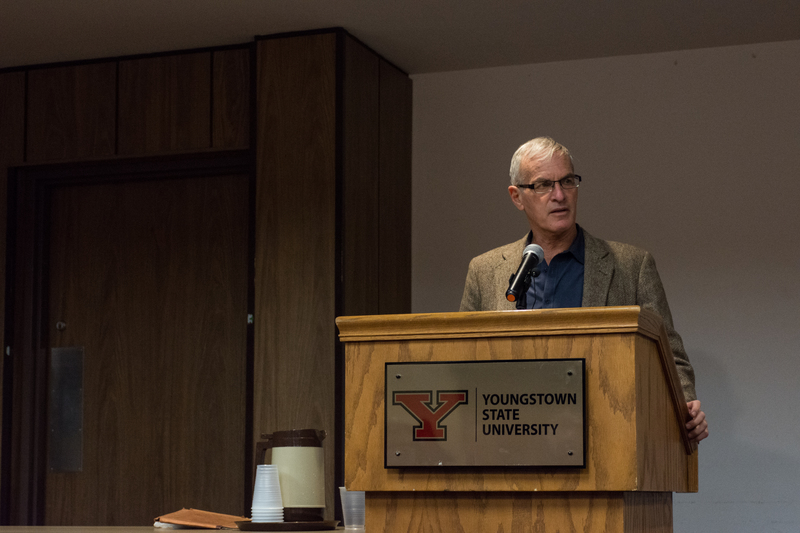 He was asked to visit YSU as a part of a lecture series presented by the Center for Islamic Studies, the James Dale Ethics Center, the Center for Judaic and Holocaust Studies and the College of Liberal Arts and Social Sciences. Finkelstein was born into a family of Jewish Holocaust survivors and later became an assistant professor at multiple institutions such as DePaul University, Brooklyn College, Rutgers University and Hunter College. He said he first got involved in the Israeli and Palestinian conflict in 1982 after Israel invaded Lebanon. “Up until then I was involved in other political actions. Israel and Palestine weren’t on my radar and then I proceeded to do what I always do, which is read a lot, try to get the facts right and be certain, as certain as one can be,” Finkelstein said. 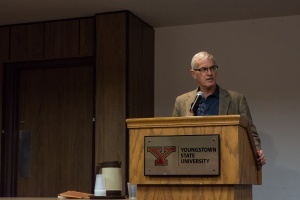 Finkelstein spoke about a multitude of topics involving the Israeli and Palestinian conflict. One such topic included if he thought the Hamas, the Palestinian-Islamic resistance group, were considered a terrorist group. “The Hamas have committed terrorist acts, but in the great scheme of things it doesn’t amount to very much. It’s basically a resistance movement, but with very marginal means of inflicting harm,” he said. Finkelstein said the period that caused “the most unjustifiable death,” was from September 2000 to 2006 when 1,000 Israelis were killed. He noted while the Hamas attacked the Israelites, 5,000 Palestinians were killed by Israeli forces, a ratio of five to one. Finkelstein also said the vast majority of the casualties on both sides were civilians. He said during the Israeli assault on Gaza, Operation Protective Edge, over 18,000 Palestinian homes were destroyed, while only one Israeli home was bombed. “The amount of death actually inflicted by the Hamas was pale in comparison to Israel,” Finkelstein said. He believes he is not the controversial person who some have painted him out to be. YouTube videos of Finkelstein speaking to broadcast journalists and talk show hosts defending Palestine and denouncing Israel have put him on the map. Some videos show him arguing with enraged Jewish students at public speaking events at universities. Finkelstein said when he speaks he adheres to international law as best as he can. He calls it “a very imperfect mechanism,” but utilizes language that coincides with international law to reach a broader audience. “If you consider international law uncontroversial and those who systematically break international law controversial, then it would make Israel and the United States controversial not me,” Finkelstein said. Some believe bringing speakers with varying viewpoints to campus supports academic freedom. Keith Lepak, associate professor of politics and international relations, said universities are platforms to discuss and debate varying viewpoints on controversial topics. “If we didn’t have controversy, a kind of silent conformism would set in. Finkelstein, born and raised in a Jewish household, is controversial for his outspoken defense of Palestinians in their historical struggle with the state of Israel,” Lepak said. Michael Jerryson, associate professor of philosophy and religious studies, said bringing alternative voices to YSU who are not inflammatory or incendiary, but rather data- and factually-driven, can be academically beneficial.